to be Under Secretary of State for Public Diplomacy. to be an Assistant Secretary of State (Public Affairs). to be Coordinator for Counterterrorism, with the rank and status of Ambassador at Large. This currently leaves us with three nominees stuck in the Senate waiting for a full vote: Susan Flood Burk, Harold Hongju Koh, and Ambassador Jeffrey Feltman. Congressional Record will be posted as soon as it goes online. On May 21st, President Barack Obama announced his intent to nominate Ambassador Nancy Powell as Director General of the Foreign Service (DGHR). Ambassador Nancy Powell currently serves as Ambassador to Nepal. She was U.S. Ambassador to Pakistan (2002-2004), Ghana (2001-2002), and Uganda (1997-1999). Previous overseas assignments have included Ottawa, Kathmandu, Islamabad, Lome, Calcutta, New Delhi, and Dhaka. In Washington she has served as a Refugee Assistance Officer, Principal Deputy Assistant Secretary for African Affairs, Acting Assistant Secretary for International Narcotics and Law Enforcement Activities, Senior Coordinator for Avian Influenza, and the National Intelligence Officer for South Asia at the National Intelligence Council. Born in Cedar Falls, Iowa, Ambassador Powell joined the Foreign Service in 1977 following 6 1/2 years as a high school social studies teacher in Dayton, Iowa. She is a 1970 graduate of the University of Northern Iowa. She has studied French, Nepali, Hindi and Urdu. She is the recipient of the Partnership for Public Service 2006 Service to America Homeland Security Medal and the Arnold L. Raphel Memorial Award. Ambassador Powell has been US Ambassador to the Kingdom of Nepal since July 2007. She is career member of the Senior Foreign Service, class of Career Minister. She would succeed Harry K. Thomas, Jr. who has been DG since September 2007. 4th of July Celebration – in May? Our embassies and consulates overseas celebrate the 4th of July every year. But this year, one post beat out everyone else. My tipster says that at one US Embassy in the EUR Bureau, a reception was held to celebrate our 233rd year of independence reportedly last week. 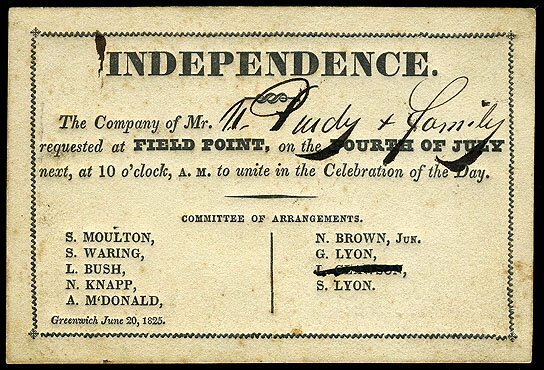 It was called the “Independence Day Reception.” I don’t know if there were fireworks. The embassy also published on its website a public acknowledgment for “the following sponsors for their generous support of our 2009 Independence Day reception.” No photos though. I don’t know folks. I’m confused. The 4th of July celebration in May? What’s next, Christmas in June? Thanksgiving Day in December so we only need to hunt one turkey? There is one thing that particularly bugs me about these 4th of July receptions – officers going out with their begging bowls to corporate sponsors. It is just so … so tacky. Nobody enjoys doing this, folks complain about it (though not loudly), yet that’s the way it’s been done for many years. At least as far back as 1996 when I started paying attention, but probably this practice dates back to earlier years; just can’t say for sure when. Tut…tut … okay, “may accept,” passive action, I supposed that’s fine, but solicit? What else would you call this but simply tacky … or try meretricious … You know entry-level officers would be saddled with this project, don’t you? No employee may make any commitment to an actual or prospective donor that implies that the donor will receive any advantage or preferment from the U.S. Government as a result of the donation, including a promise to intervene on behalf of the donor with the host government, a commitment to invite the donor to official functions, or an assurance that the donor would have preferential access to official facilities. In the course of his or her official duties, no U.S. Government employee may afford any donor preferential treatment as a result of a donation (see page 17). In short, you can get the hamburger guys to donate 1000 burgers for the reception, but when they need USG assistance to deal with their host country problems, you can’t give them any preferential treatment. Sometimes I do wonder if the folks who write these rules ever live in a real world with real people exhibiting normal human behavior. This seems to me like one more reflection of our government living beyond its means. If the government wants official diplomatic receptions, then let’s have a reception – but our government should appropriate funds for it. We must pay for our own official party. If we can’t pay for it, well then, can’t have one. We can’t spend what we don’t have, or can we? Until one day, some colonel or general decided to look up the original order. After a good deal of looking around, he found it. Thirty-one years, 2 months and 4 days earlier, an officer ordered a guard to stand next to the bench that had just been painted so no one would sit on the wet paint. Read NoDoubleStandard’s whole post here.